Well I received a text message today to tell me that Australia Post will be delivering my first kit tomorrow. 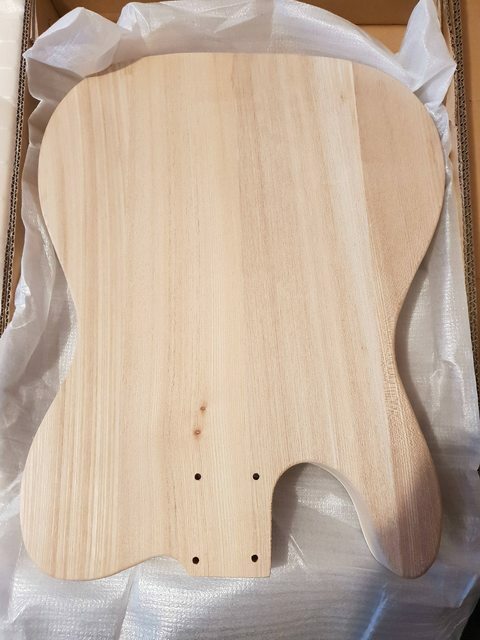 I've been looking around the forum quite a lot and my initial plans at this stage is to do Tru Oil on the neck and headstock and Dingotone wax for the fingerboard. For the body I'm looking at the different stains and dyes around. Would appreciate some input from other people. I've looked at the U-Beaut, Angelus, Wudtone, Colortone and Dingotone dyes. Would be good to hear the pros and cons from people that have used each. 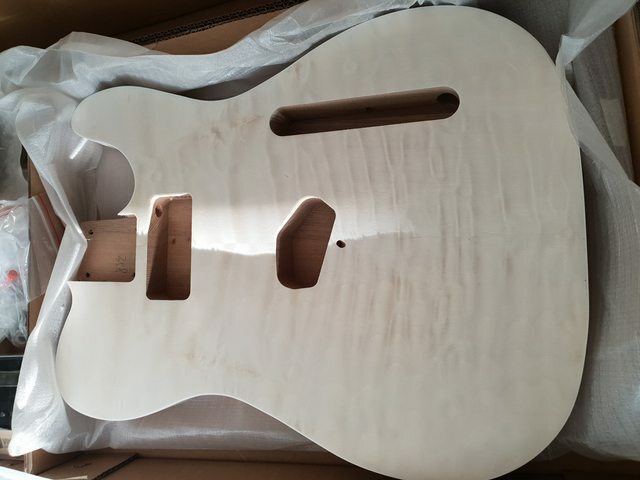 Also what are people using over the dye to seal and finish their guitars? A lot have used Tru Oil and I've seen some mention of clear nitro. Any other options that are worthwhile considering? 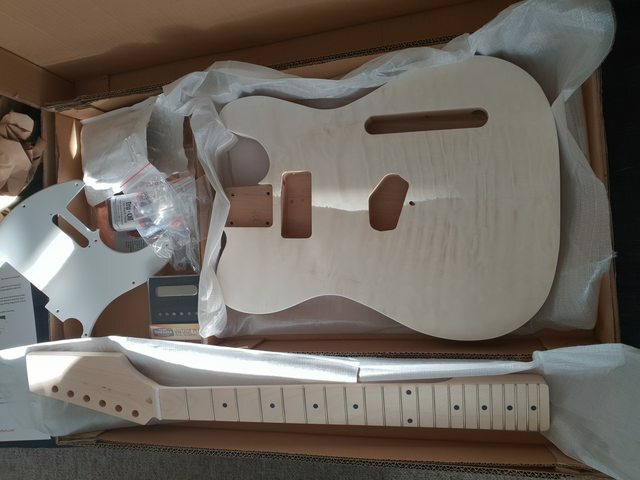 And as the it is an Ash body what grain filler do people recommend? Well the kit has arrived. I've had a brief look and a few things I've noticed. There are a couple of tool marks in the veneer which is a little disappointing but I'm sure there is a way to deal with that. The neck fit is nice and snug. The holes drilled for the screws for the neck don't have great alignment with the plate, not sure yet if I can get away with them or not. I'll do a proper mock-up this weekend and see what I'm working with. Last edited by Woltz; 03-09-2018 at 03:10 PM. Best not to sand the top if you can get away with it. As for body filler Timber mate is good as it can be diluted down into a slurry with water and obviously cleans up in water too. Only downside is that it re-hydrates if using a water based stain and can then cause shrink back or maybe in some instances grain swelling. The alcohol based dyes seem to get around that problem and I am yet to try them and test that theory. Did my first & second builds with Dingo Tone, 3rd, 4th & 7th with water based inks, with my Red J Bass the only Ash body where I first experienced timber mate shrink back and didn't mind the look and kept it as an additional feature. Dingo Tone has some nice colours however it takes a lot more care and patience to work out right. Welcome to the forum and look forward to seeing how things progress. So I did a bit of a mock build to check a couple things. From what I can tell by eye the neck looks to be straight. There is a little tool mark on the fretboard around the 6th fret. Hopefully once I wax up the fretboard it won't be noticeable. Scale length checks out ok. Nut to 12th = 323mm and I've got enough room with the placement of the bridge to get 323mm from 12th to saddles. The Pitbull manual suggests approximately the middle of the adjustment. The question is where on the adjustment is best to work on? Things I've identified so far that I'll have to address. 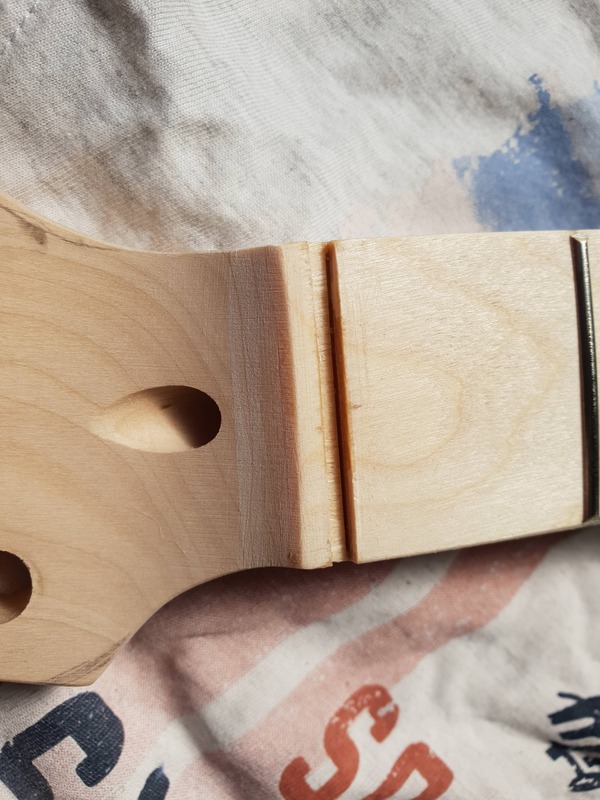 Enlarge the bridge cavity to allow for space for the Tonerider bridge pup. 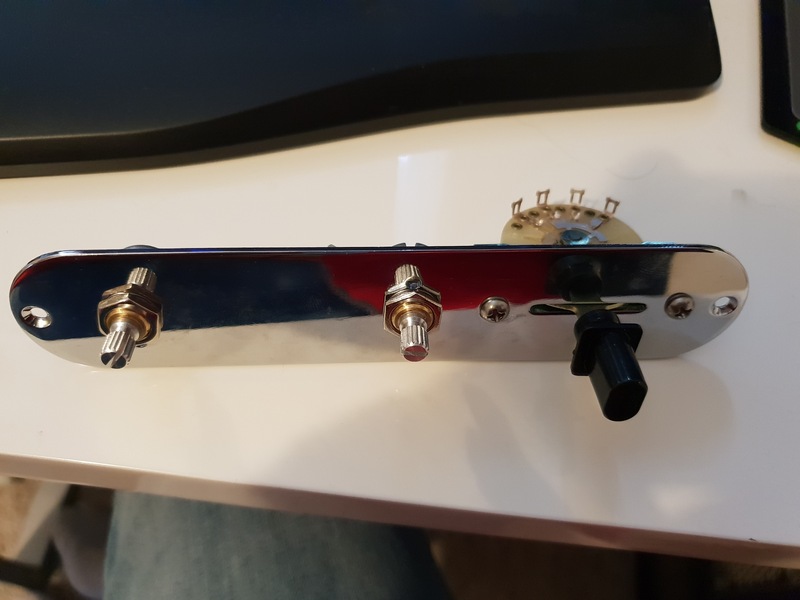 Get some different screws to mount the neck pickup at the woodscrews provided aren't long enough to get the neck pickup at the correct height. Drill the switch plate holes out to allow for the bigger pots. 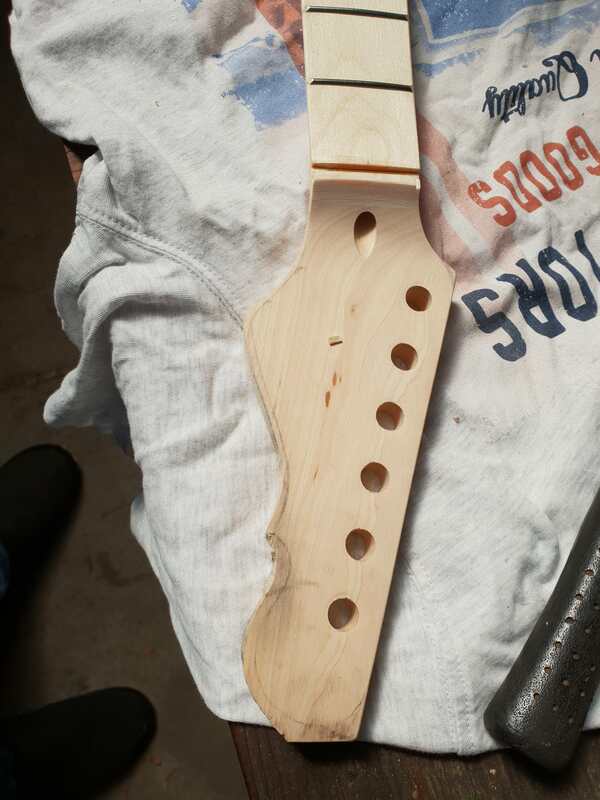 And I'll probably look at how to fill and redrill the neck holes because the alignment isn't as good as I'd like it. I got a bit of work done over the weekend. 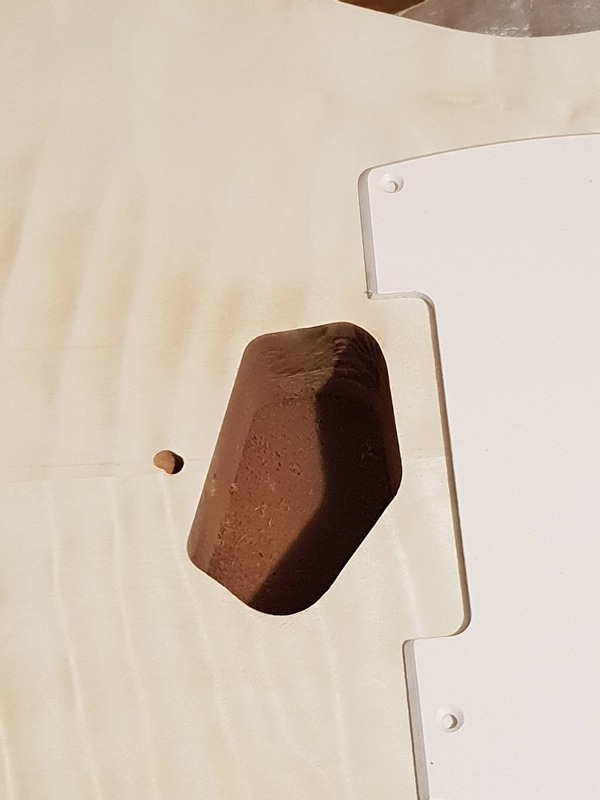 Enlarged the bridge cavity slightly so now the tonerider pup fits, I will do another mock-up to double check scale length with the bridge sitting in position but rough measurement looks good. 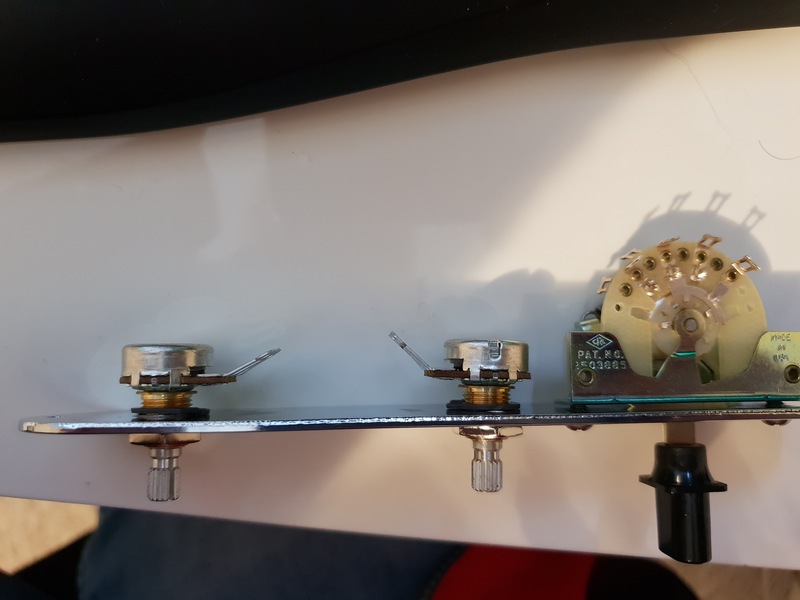 I also drilled out the holes in the switchplate to 9.5mm to accept the bourns pots. Because they are longer than the original pots I put a circlip on the back to get the correct protrusion until I can get nut another for the back. Test fit of the bridge and switchplate with the upgraded components. 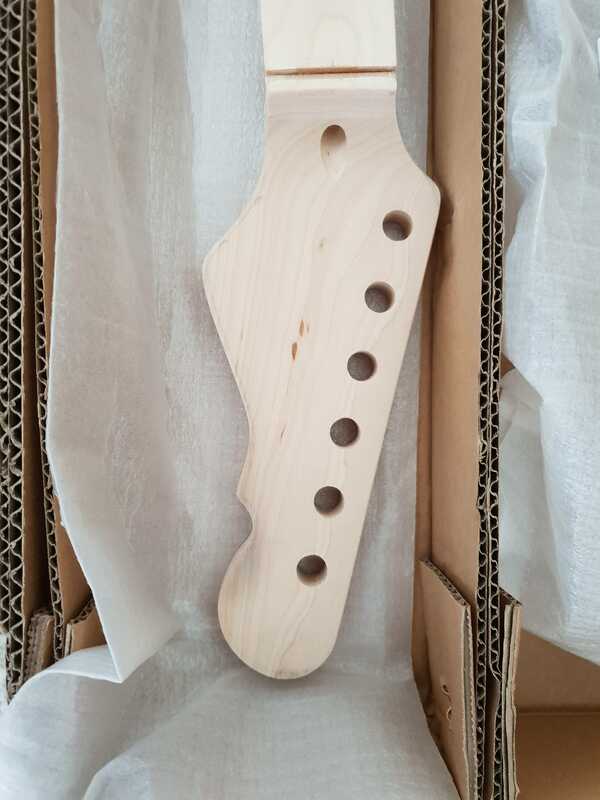 Now to the headstock. Rough cutout with the jigsaw. And then knocked out the old nut. First swear words of the build. When I gently knocked out the nut took a chip from the edge of the slot. Luckily I was working on an old t-shirt on the bench in my shed and I found the little chip. So a bit of superglue to the rescue. 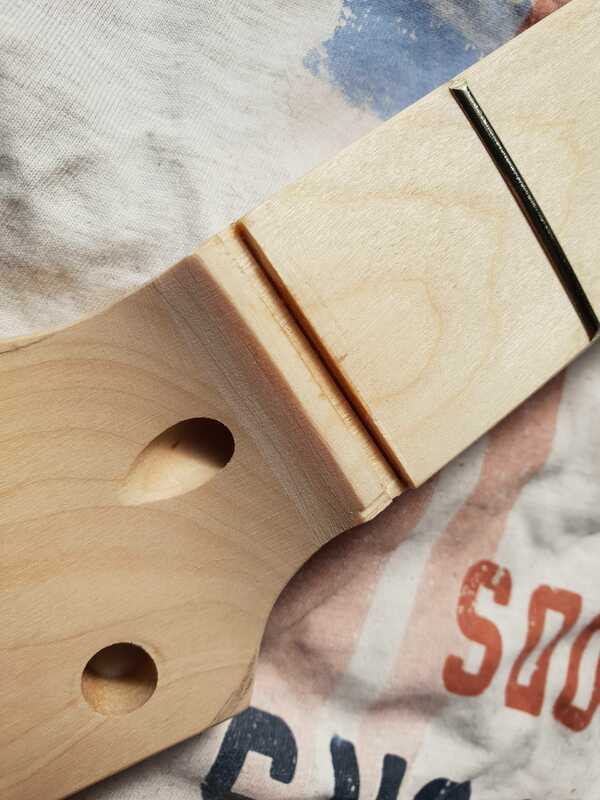 And then finally sanded the shape into the headstock. Will need a little more sanding but pretty close. 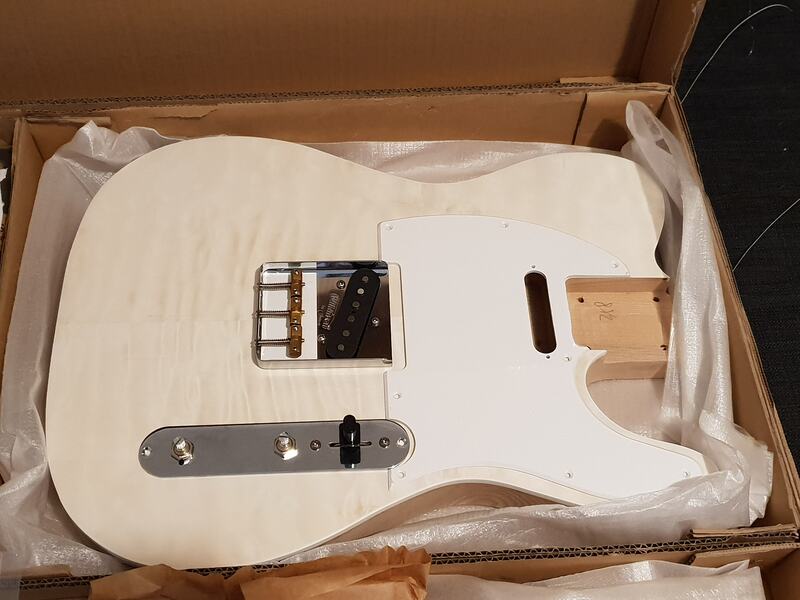 After measuring what felt like about 100 times I drilled and attached the neck and bridge and put some of the strings on to check tuning and intonation. Testing out the colour. Ebony timbermate first then sanded back and then applied the dye. Tested out what would happen by wiping some off with the methylated spirits to give a lighter colour as well. Bottom piece is Ash and smaller piece is Maple. Last edited by Woltz; 15-09-2018 at 12:04 PM. coming along nicely indeed, that colour is going to be great . Agree and like the darker shade. Don't be getting that Norton tee-shirt dirty, standards to hold up there!